Heritage for Peace are pleased to announced they have been awarded a grant by the Gerda Henkel Foundation to create a course for Syrians teaching the importance of, and intersections between, national, international and Islamic law, in partnership with the group Save Muslim Heritage. We aim to disseminate the course through contacts in Syria, and through targeted training, raising awareness of the obligations towards heritage protection. View of light damage to historic buildings in Dahes. Copyright: DGAM. Community activists in Idlib province have sent the DGAM pictures of the well-known village of Dahes in the UNESCO Ancient Villages of Northern Syria World Heritage site, showing minor damage. See the brief and photographs here. 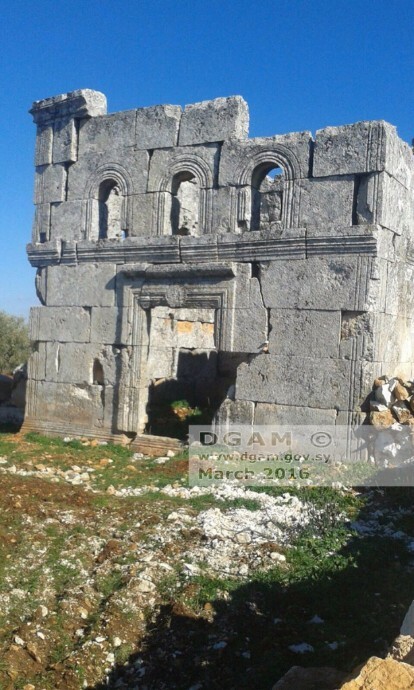 On February 22 2016 the Sarkhet Turath- Souria (Heritage Shout-Syria) published a new image of Qlib Louzeh (Qalb Lozeh) Church, west of Aleppo. See the photograph here. The Expressen offers hidden camera footage of destruction at Palmyra on February 24 2016, available here. On March 10 2016 the Association of the Protection of Syrian Archaeology released photos and a video showing the bombing of the archaeological site in Palmyra by the Russian Air Forces. See them here. This was also picked up the in The Times (subscription only, but the text is available via our Facebook page). On February 24 the DGAM thanked the local communities in Qamishli for helping to recover looted antiquities. See the DGAM report here, and other reports here and here. A recent international conference held by ARCA in London on February 27 2016 aimed to identify the truth about the Daesh’s illicit trade in antiquities. See coverage in the Art Newspaper here. French art police are on the hunt for stolen antiquities, as an article in Worldcrunch reports on March 7 2016 here. The DGAM participated in the INTERPOL Experts Group on Stolen Cultural Property on March 8 and 9 2016 in Lyon. See details here. The DGAM participated in the ICOMOS colloquium on post-trauma reconstruction in Paris on March 4 2016. For more information, see here. On February 24 the DGAM announced that it has created 3D models of the Umayyad Mosque and Ugarit, developed in collaboration with ICONEM. On 14 March the DGAM announced here that it has created 3D models of Jableh, available , developed in collaboration with ICONEM. For *AMAZINGLY COOL* videos of the models see here. For a news article on these efforts from March 14 2016 see this story. The work of Syrian Amr al-Azm is featured on March 8 2016 at Good Magazine here. The Guardian on March 2 206 looks at the work of Syrian refugees in creating artwork based on threatened or destroyed Syrian cultural heritage. See the article and photographs here. The UN Special Rapporteur for cultural rights, Karima Bennoune, on March 4 2016 declared that a people’s cultural heritage is indivisible from their rights, and that the destruction of heritage is a violation of those rights.”When cultural heritage is under attack, human rights are under attack,” she said. See the full statement on the UN Human Rights website here, and find more on the UN News Centre here. A new book by Franklin Lamb entitled “Syria’s Endangered Heritage” is now available. For more information, see here. The current edition of the International Journal of Cultural Property includes an article entitled “The Destruction of Cultural Property in the Syrian Conflict: Legal Implications and Obligations”, and is co-authored by HFP’s Dr. Emma Cunliffe. See more here. If you can’t access the journal directly, contact Heritage for Peace for a copy of the text. The International Committee of the Red Cross have recently signed a Memorandum of Understanding with UNESCO to further strengthen cooperation on the protection of cultural property during armed conflict. They have released a Q&A explaining why they have done this whilst, at the same time, pushing the various humanitarian arguments for acting on this issue. On December 11/12 2015 ASOR held a two-day conference in Washington DC discussing projects aiding cultural heritage in Syria. For podcasts and videos from the 2 hour lightening round, covering work ongoing in Syria now, see here. Alternatively, the UK National Committee of the Blue Shield has made available a quicker PDF transcript of the conference, which can be found here. UNESCO is collaborating with the Swiss and the French to support Syrian heritage professionals working in Syria buy supplying materials, detailed here. On March 9 2016 diplomats from the Middle East and North Africa were hosted by the Antiquities Coalition and the Middle East Institute in Washington DC to discus culture under threat, detailed here. ASOR Cultural Heritage Initiatives Weekly Report 79–80 (February 3, 2016 – February 16, 2016) has been posted here. Recent photographs and video of the Aleppo Citadel show the severity of the damage to the area (ASOR CHI Incident Report SHI 16-0018). The Day After Heritage Protection Initiative produced a report on the damage to the Al Adiliah Mosque located southwest of the Aleppo Citadel (Appended TDA Report). Russian airstrikes damage the al-Hamza Mosque in Anadan, Aleppo Governorate (ASOR CHI Incident Report SHI 16-0019). SARG airstrikes damage the Sidiq Mosque in Palmyra, Homs Governorate (ASOR CHI Incident Report SHI 16-0020). The Raqqa Cultural Center in Raqqa Governorate hit by airstrikes (ASOR CHI Incident Report SHI 16-0021). Russian bombardment damages the Al-Khayrat Mosque in Aleppo (ASOR CHI Incident Report SHI 16-0022). DGAM shows evidence of damage to Qalaat Saladin in Latakia Governorate (ASOR CHI Incident Report SHI 16-0023). SARG airstrikes damage the al-Farooq Mosque in Masqan (ASOR CHI Incident Report SHI 16-0024) and the Al-Kabir Mosque in Hayyan (ASOR CHI Incident Report SHI 16-0025) in Aleppo Governorate. SARG missiles allegedly damage columns in the Roman theater in Palmyra, Homs Governorate (ASOR CHI Incident Report SHI 16-0026). DigitalGlobe imagery shows Nineveh (ASOR CHI Incident Report IHI 15-0097 UPDATE) and the Nebi Yunus Mosque Complex (ASOR CHI Incident Report IHI 16-0004) in Mosul further damaged by development. SARG airstrikes damage the Al-Nasr Mosque in Gharnata, Homs Governorate (ASOR CHI Incident Report SHI 16-0027). SARG bombardment damages the Abu Bakr al-Sideiq in Kafr Zaita, Hama Governorate (ASOR CHI Incident Report SHI 16-0028). The Day After Heritage Protection Initiative produced two reports on the archaeological site of Apamea, Idlib Governorate (Appended TDA Report). ASOR Cultural Heritage Initiatives Weekly Report 77–78 (January 20, 2016 – February 2, 2016) has been posted here. An intentional fire caused extensive damage to Imam Hassan Shrine in the district of Laylan, southeast of the city of Kirkuk, Kirkuk Governorate (ASOR CHI Incident Report IHI 16-0003). Russian airstrikes damaged the interior of Omar Bin Al Khattab Mosque in Bayanoun Town in Aleppo Governorate (ASOR CHI Incident Report SHI 16-0002). Suspected Russian airstrikes damaged Al Nour Mosque in the town of Al Boleel, Deir ez-Zor Governorate (ASOR CHI Incident Report SHI 16-0012). DGAM reported structural damage to the Daraa National Museum caused by mortar shells fired by armed groups (ASOR CHI Incident Report SHI 16-0013). Regime and Russian airstrikes cause damage to Hinni Mosque in the Old City of Raqqa, Raqqa Governorate (ASOR CHI Incident Report SHI 16-0014). Russian airstrikes damaged Abu Bakr Al Sedeiq Mosque in the city of Al Bab, Aleppo Governorate (ASOR CHI Incident Report SHI 16-0015). Regime airstrikes caused damage to five columns in the archaeological site of Palmyra, Homs Governorate (ASOR CHI Incident Report SHI 16-0016). ISIL carried out three bombings near the Sayyida Zeinab Shrine, Damascus Governorate, causing no reported damage (ASOR CHI Incident Report SHI 16-0017). The Day After Heritage Protection Initiative produced two reports on the Al-Ma’aara Museum and the Citadel in the city of Ma’arat al-Numan, Idlib Governorate (Appended TDA Reports). ASOR Cultural Heritage Initiatives Weekly Report 75–76 (January 6, 2016 – January 19, 2016) has been posted here. Shia militias attacked several Sunni mosques in the city of Muqdadiya, Diyala Governorate (ASOR CHI Incident Report IHI 16-0002). Suspected Russian airstrikes damaged two mosques in Aleppo city including the Abdullah bin Abbas Mosque and the Agha Jaq Mosque (ASOR CHI Incident Report SHI 16-0003). DGAM reported illegal excavation, looting, and illegal construction in Quneitra Governorate (ASOR CHI Incident Report SHI 16-0004). Regime airstrikes damaged the Aisha Mosque in the city of Deir ez-Zor (ASOR CHI Incident Report SHI 16-0005). Regime shelling severely damaged Al Hadi Mosque in Babeis Town in Aleppo Governorate (ASOR CHI Incident Report SHI 16-0006). Suspected Russian airstrikes damaged al-Kabir Mosque in Mu’arrassat al Khan Town in Aleppo Governorate (ASOR CHI Incident Report SHI 16-0007). Regime airstrikes targeted Al Kabir Mosque in Al Mouzra village in Idlib Governorate, causing severe damage (ASOR CHI Incident Report IHI 15-0008). Regime warplanes fired missiles on al-Kabir Mosque in Deir al-Asafir village in Damascus Governorate, causing severe damage (ASOR CHI Incident Report SHI 16-0009). Regime shelling damaged an unidentified mosque in Zamalka in Damascus Governorate (ASOR CHI Incident Report SHI 15-0010). Opposition forces shelled the First Armenian Evangelical Church of Emmanuel in Azizeyah Neighborhood in Aleppo City in Aleppo Governorate, causing severe damage (ASOR CHI Incident Report 16-0011). On February 24 2016 The Atlantic Council gives an overview of international actions to save Syrian antiquities here. The American National Endowment for the Humanities (NEH) is calling for applications of grants, for projects dealing with research addressing ‘imperiled cultural heritage’. Contact the Division of Preservation and Access:preservation@neh.gov. The must-read article – on 12 March 2016 the ARCA blog looks at journalist ethics on the reporting of cultural heritage destruction, and how old stories are recycled as new. See it here. Also well worth listening to – the BBC has launched a new series called The Museum of Lost Objects, examining cultural heritage destroyed in Syria and Iraq. See here for an overview of the series and a discussion of the Temple of Bel. Artist Morehshin Allahyari and his colleagues have created 3D versions of destroyed objects that can be downloaded for printing. See the brief article in the Observer from February 17 2016 here. An oped republished in the Chicago Herald Tribune on March 12 2016 sees the current case involving Ahmad Al Faqi Al Mahdi as a test case for prosecuting those responsible for the destruction of cultural heritage. Read it here. In Counterpunch on March 9 2016, Franklin Lamb weighs in on the likely positive consequences of the Syrian truce for heritage conservation here. Professors from the University of Texas at Austin discuss Daesh on March 1 2016 in the Austin Chronicle here. British historian Simon Schama looks at iconoclasm in the Middle East for BBC Radio 4 on February 28 2016 in a program called “The Obliterators.” Hear it here and see the review of the program on The Independent here . NPR interviews reporter James Harkin about covering the destruction of archaeological heritage in Syria here. (see Harkin’s piece in the Smithsonian Magazine from our previous newsletter here). The New York Times on March 11 2016 examines international efforts to fight looting and the illicit trade in antiquities here. See also this article by the same author, covering similar ground.